I’ve searched high and low, around the world, and for about six months for an eye cream that contains SPF. 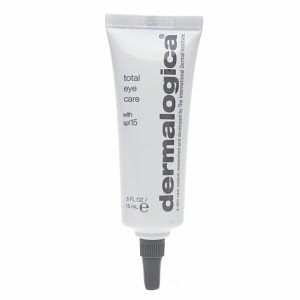 My search finally led me to Dermalogica Total Eye Care with SPF 15. I’m religious about sunscreen and wear it every day, in part because I’m afraid of melanoma but mostly because I’m vain and I want to prevent wrinkles and age spots. The sun’s harmful UV rays cause 90 percent of aging signs, especially around the eyes -- that’s because the skin around the eyes is ten times thinner than the skin on the face. On top of that, night eye creams are not always appropriate for day. For example, since my main eye concerns center around fine lines, my night eye cream contains retinol. There’s a lot of debate as to whether retinol should be used during the day, since its main function is cell turnover and that causes skin sensitivity in the sun. I just play it safe and keep retinol for nighttime use. 1) It contains chemical free sunscreen and no artificial color or fragrance. This protective eye cream has never irritated my sensitive, contact-wearing eyes. 2) It’s slightly tinted and has optical light diffusers that instantly brighten my genetically dark circles. I look more awake than I feel and I’ve stopped using concealer under my eyes. 3) The gentle alpha hydroxy acids and plant extracts smooth fine lines. This eye cream not only prevents wrinkles, it counters existing problems. 4) The formula is moisturizing without being greasy and it absorbs incredibly quickly. I don’t need any waiting time between applying this eye cream and applying my crayon eyeliner, and there’s never an issue with raccoon eyes. So hear me preach, ladies: if nowhere else, please wear SPF around your eyes! Dermalogica Total Eye Care with SPF 15 retails for $45 at drugstore.com.